Swimming Pool Chlorine | How Does Chlorine Work? Understand Pool Chlorine & Proper Swimming Pool Shock Treatment For Inground, Above Ground & Salt Water Swimming Pools. Mastering pool chemistry is not all that difficult. In fact, I taught over 35 lifeguards at the YMCA in Oregon the ins-and-outs of pool water chemistry and how to maintain a 100,000 gallon commercial salt pool. Believe me, if they can get it and do it, you can as well. It just takes the right information and a little diligence. Your swimming pool water chemistry must be met for your chlorine to work properly. It's the most widely used and one of the more cost effective ways for disinfecting. This is of the utmost importance in properly balancing your pool water chemistry. 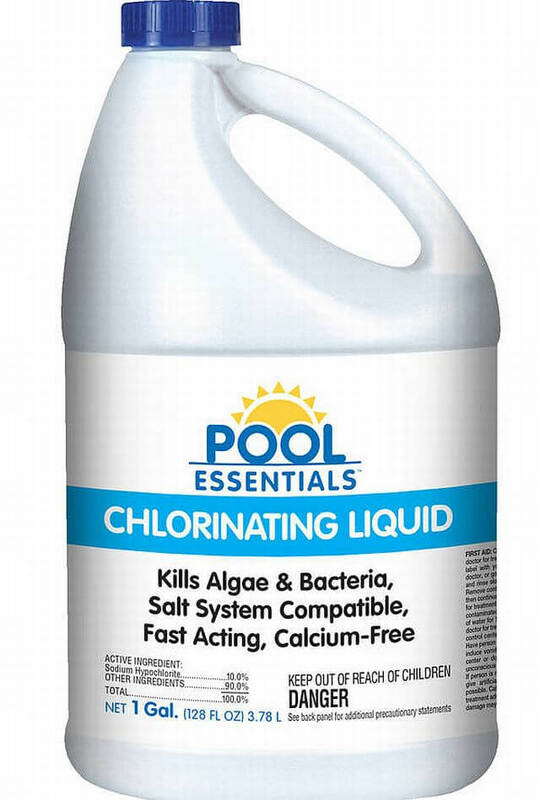 Chlorine is the sanitizer for the pool water and should be kept at 2 - 4 ppm. Safe to use for super chlorination with your salt water pool systems and general salt water pool maintenance. Just be sure to turn off your salt cells (swimming pool chlorine generator) before you shock it. Always take the proper precaution with any kind of swimming pool chemical. Remember to read the manufacture’s labels. Remember that salt water swimming pools are not considered chlorine free pools. They still produce hypochlorous acid (chlorine generator pool). A good salt pool chlorine generator will still give you great swimming pool care and maintenance. Free chlorine is amount of active chlorine ready to do its job. In the hot summer months your sanitizer can degrade rapidly. The sun will wreak havoc on your pool and for this reason any adjustments should be done in late afternoon or early evening hours. This allows enough time for it to go work immediately and start sanitizing your pool. It should be either broadcast (Calcium Hypochorite) or poured (Sodium Hypochlorite/ liquid) evenly, starting in the deep end and kept at 2 - 4 ppm. If you have an outdoor pool and you're using it up like crazy I would then encourage you to check your cyanuric acid (pool stabilizer) level. Too little, below 20 ppm, and your pool chlorine will hit bottom. Too too much cyanuric acid, above 70 - 80 ppm, and it can't do the job. One of the best ways to add cyanuric acid to you pool is with chlorine tablets. You can also use granular chlorine like sodium dichlor or trichlor. The range for CYA is 30 - 50 ppm. If you have one of the many kinds of small swimming pools or kiddie pools, just a tiny bit is needed to keep them sanitized. If you're having problems with your swimming pool chemistry, you're not alone. Thousands of pool owners just like you are having the same issues. But there's nothing wrong with you. You're NOT wrong. What you're TOLD is wrong. The information you're getting about your pool simply goes against the Universal Laws of Pool Chemistry & Physics that apply equally to every salt and chlorine pool in the world. Any advice given to you about your pool will either CONFIRM or CONTRADICT these applicable Universal Laws of Pool Chemistry. How Long Do I Need To Wait Before Swimming After Adding Swimming Pool Chemicals?